We can never get enough pair of shoes in our closet, right? so, I decided to buy this Zara burgundy heels last week because I noticed that I needed more colorful shoes:) I may still need more colors on this department ... New pair of shoes is requiring a lovely outfit and this is what I decided to wear last Tuesday : burgundy jeans, mustard sweater and my yellow vintage bag ( Fall colors). I keep it casual, and as always, with a burst of color/s. wow! the colors of your outfit are so striking together. in the photos, the colors of the background in combination with your outfit make the perfect autumn combination! This is MY favorit outfit for Fall!! !Too bad here in Crete is still summer!!! !Color combo perfection!!!!! Wow!! I’m in love with this combo!! 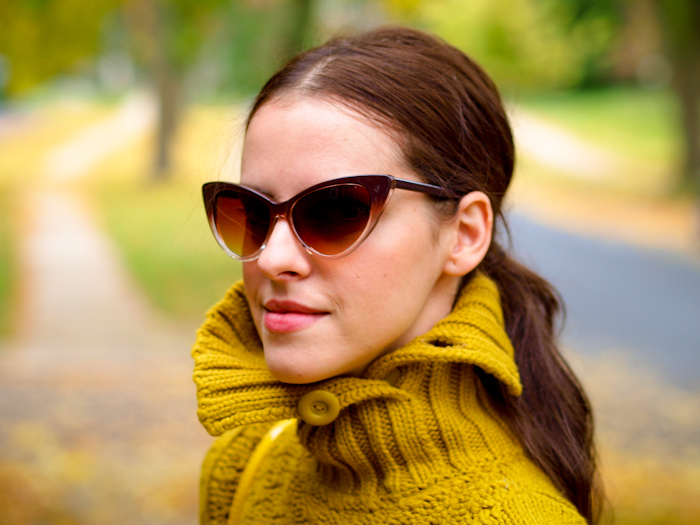 Great sunnies and sweater! wow! great look! amazing colors!! These photos are a treat for the eyes! Love all these colors together with the leaves in the background! Well done! beautiful color on color outfit!! NO! A girl can never have enough shoes! BTW… these are wonderful. Loving burgundy… always! My lovely Veronica this is the epitome of Autumnal bliss!! Excellent one! 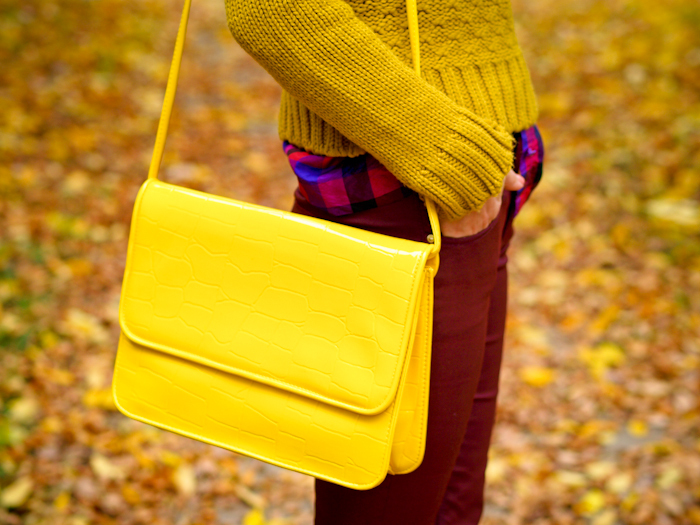 I adore how you’ve combined all these colours together… perfect fall look! great outfit..the colours are amazing! What a lovely juicy outfit! Nice! I love the added color with the button down and shoes!! Those Zara heels are perfect! I love this look the shoes are beautiful I got them too I just wasnt in love with them but after seeing you in them I think Im in love all over again. I have them in all three colors black is my favorite though!! you can play with colours! the colours are perfect for fall! amazing colors! I wish UK was same beautiful like your place! The colours in this outfit are so vibrant and lovely! And the cat’s eye shades? Fabulous. Beautiful outfit, I love how you incorporate your Happy Wrist Bracelets and the colours, the background everything is just perfect! I was just thinking about how much I loved this colour combo and it looks fantastic on you! Love those side zipped pants! – Thought they were Zara at first! you’ve mixed the colors just perfectly! I have the same pair of jeans and I gotta say, they are one of my favorite pairs – great color, perfect fit and they don’t stretch out at all which is more than great! Such beautiful colors together. 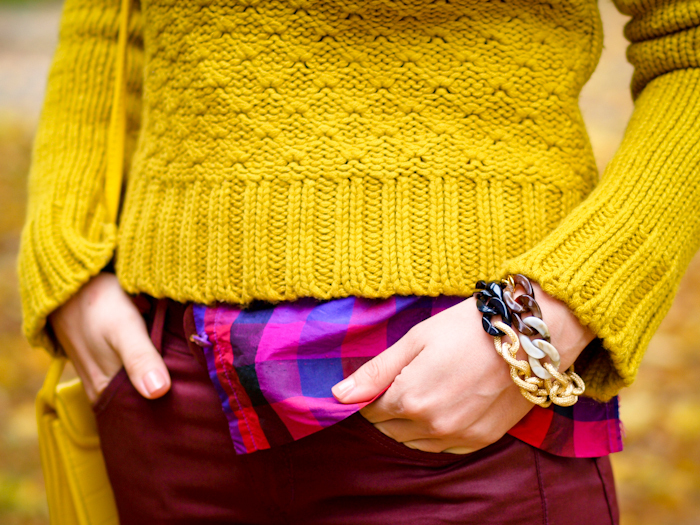 Love the yellow, pink plaid and burgundy. Very beautiful shoes, gorgeous color! Congrats on such a great find! Another gorgeous outfit!! Really loving your blog!